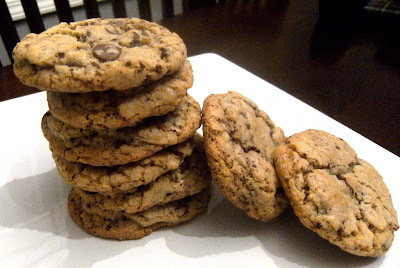 I've been working on developing a recipe for the best chocolate chip cookie for a while now. My colleagues have eagerly been my test subjects. After playing with a few variables (melted butter, instant espresso, etc), a 'Nieman Marcus'-resembling recipe is the front-runner right now. Here's the legend of these cookies and how they got their name. I'm still acting on my baking mantra: BAKE 'EM & TAKE 'EM, BAKE 'EM & TAKE 'EM, BAKE THEM AND TAKE THEM AWAY! He so graciously accepted. He's a gentleman like that. Flour, oats (which we'll blend into oblivion with a food processor), white sugar, brown sugar, 4 oz. chocolate bar, 12 oz. 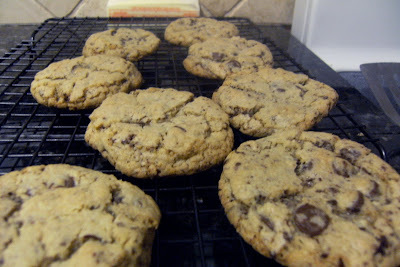 semi sweet chocolate chips, butter, eggs, baking soda, baking powder, salt. 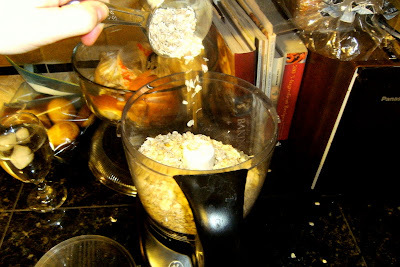 First thing I do is put 2 1/2 cups of whole oats (not quick oats, the real deal) into the food processor. Set it and forget it. You want this stuff as fine as you can get it. It's here for flavor, not texture. 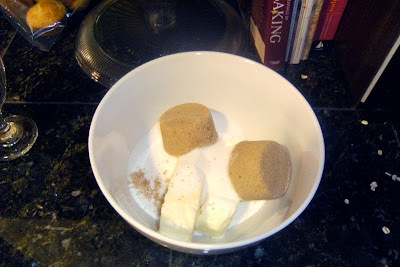 In a large bowl, add 2 sticks of softened butter, 1 cup of sugar, and 1 cup of brown sugar. It's your basic cookie starter. Start on low, creaming the butter and sugar together. 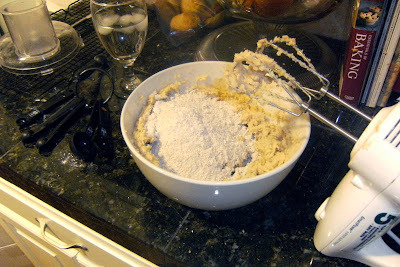 Once it has started blending, turn the mixer up to high and keep going until they're fully incorporated. 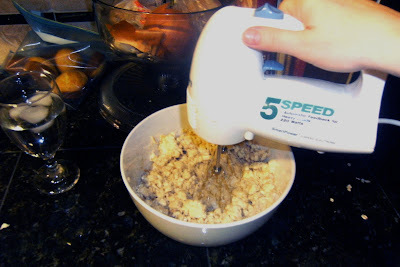 The mixer will start to labor once you've gotten them fully creamed. Add 2 eggs and a teaspoon of vanilla, and mix until fully incorporated. Go ahead and dump in the processed oats (you could have turned them off a while ago, but if not - fun!). I still use the mixer at this point. Get it all mixed up. Now, for the fun part. And by fun, I mean SUCKY. But I got the Stallion to do it this time while I was finishing up incorporating the dry ingredients. Ha! P.S. I go back and forth between using milk chocolate and dark chocolate for this part. I think I like milk chocolate best - but go with what you like. The 4 oz. of chocolate bar must be grated. I've always used the food processor with the grating disc attachment. It was too difficult by hand. But it was also way too stressful in the food processor. There's no real way to keep pressure on the chocolate all the way through, and all of the heat from the friction causes a lot of it to melt. UGH. But of course, the Stallion is smarter than me (and more impatient. when it comes to cookies, anyway). I saw a recipe one time that called for grated chocolate. I got to held up on grated. The recipe really should have said finely chopped chocolate. SO. MUCH. EASIER. So yeah, do it this way. And keep the chocolate in the freezer - it'll make it even easier. Back to the dough. 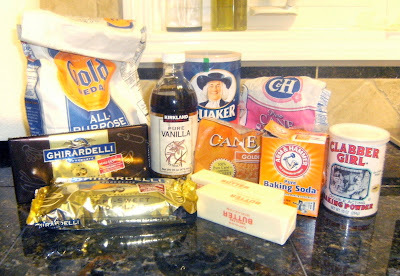 Go ahead and add in 2 cups of flour, 1 teaspoon each baking soda and powder, and 1/2 teaspoon salt. Mix until just incorporated. Then roll into balls onto a parchment-lined baking sheet. Put into a 375 degree oven for 10-12 minutes, or until they're golden brown and done to your liking. When in doubt, I'd pull these out early. Once cool, they tend to firm up a bit. Once out of the oven, place them on a cooling rack, and watch them disappear! These made it to a plate. For the little bit of this that we get to keep, I don't bake them until we want to eat them; I keep the dough in a tupperware in the fridge. Everybody loves a fresh, warm cookie and keeping cookies from lying around helps with their mindless consumption. You could also freeze the dough in portions! 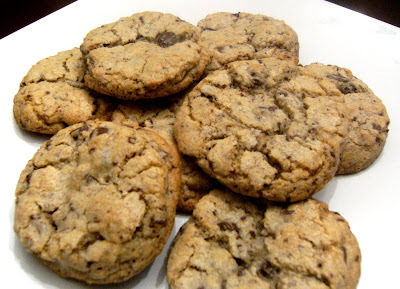 Nieman Marcus Chocolate Chip Cookies - YUM. 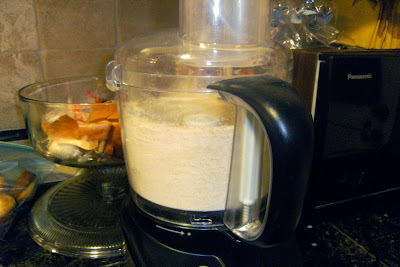 Place oats in a food processor, and blend into a fine powder. Cream together the butter and both sugars in a large bowl. 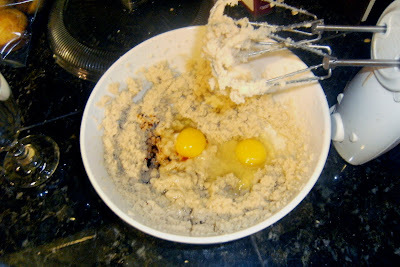 Add the eggs and vanilla and mix until fully incorporated. Pour in the oatmeal powder and mix until just combined. Add the remaining dry ingredients and stir until just incorporated. Pour in the chocolate chips and chopped chocolate, mixing until combined. Roll the dough into balls and place on a parchment-lined baking sheet. Bake for 10-12 minutes or until golden brown. When in doubt, I'd pull these out early. Once cool, they tend to firm up a bit.